In what could be the nicest (and strangest) story you'll read all day, a group of thieves who lifted several computers from a Los Angeles office building returned the stolen goods after realizing that they had just ripped off a support center for survivors of sexual assault. 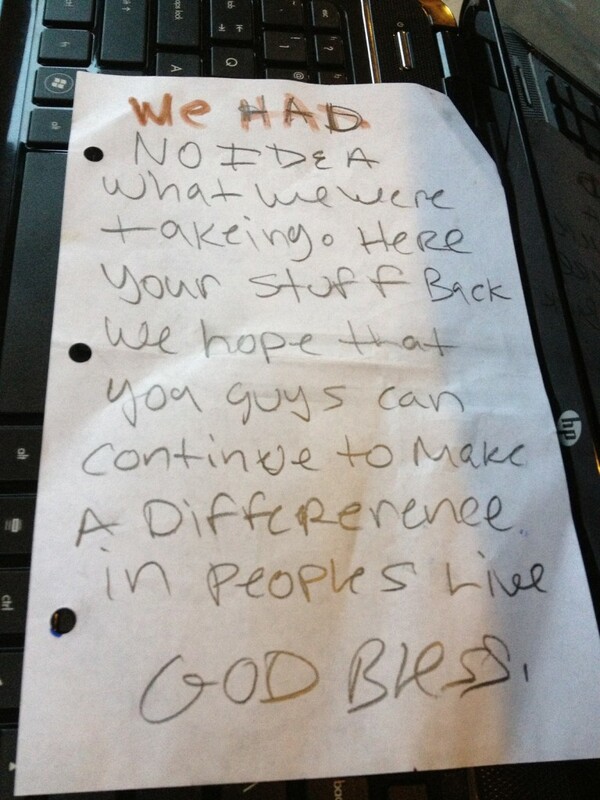 The burglars felt so bad about stealing from the nonprofit that they even included a note of apology, explaining [sic]: "We had no idea what we were takeing. Here your stuff back we hope that you guys can continue to make a difference in peoples live. God bless." Less than 24 hours after having her nonprofit ransacked, San Bernardino County Sexual Assault Services executive director Candy Stallings received a phone call from police, alerting her to more "suspicious activity" going down around her office. But when she arrived on the scene, "All my stuff was in front of the door," Stallings told NBC News. "There was a shopping cart, and there were the PCs that were taken, there was the laptop -- everything was there." Tucked inside one of the returned laptops was the note. Investigators took the letter of apology as evidence, but not before Stallings made a copy. She plans to frame it, she says.